Art Behind the Zion Curtain, David Owen, Sebastian Maniscalco and more. The term "Zion Curtain" conjures up a few images for people who live here, like the secretive area in restaurants behind which adult beverages are mixed. Or, for old school SLC punkers, the classic KRCL radio show hosted by Raunch Records' Brad Collins. In general, it represents the effects of living in what is virtually a theocracy. Modern West Fine Art's new gallery exhibition examines local artists' interpretations on the quirks associated with living in Utah. A dozen practitioners of a variety of media respond to the theme with often humorous as well as historically resonant images. Tom Judd's "Frontier Life" (collage with oil on panel) melds settlers' dominant domestic configuration of polygamy with sensuality. Dave Newman's mixed-media piece "Utah In the Lime Lite, Starring Red Rock, Jello & Carrots" combines iconic red rocks with the gelatin dessert. 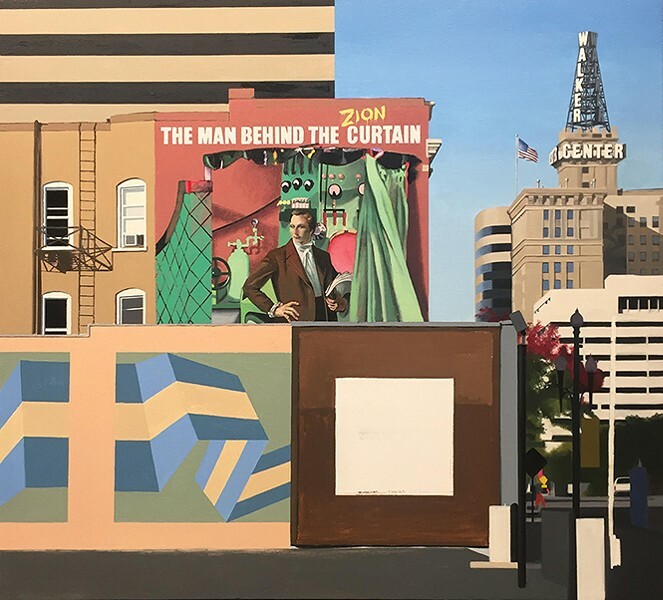 Ben Steele's mixed-media "The Man Behind the Zion Curtain" (pictured) is the show's centerpiece, playing with images of Salt Lake's downtown cityscape as well as Joseph Smith, the Oz-like man behind the curtain in the show's title. In the arid American West, the Colorado River is life itself; without its nearly 1,500 miles of water, millions of people couldn't live there, and billions of dollars in economic activity wouldn't be possible. As a result, it's one of the most carefully managed natural resources in the world—but still one of the least understood. 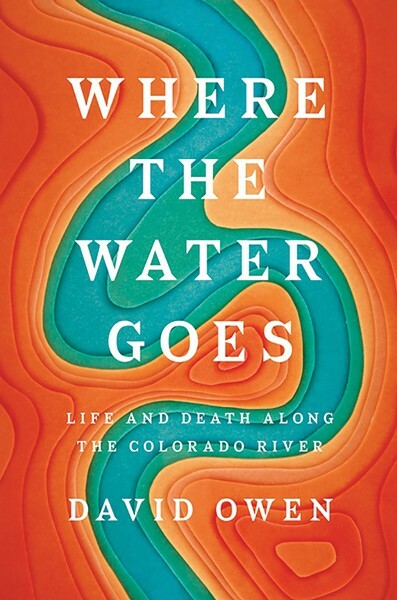 New Yorker staff writer David Owen attempts to rectify that shortcoming with Where the Water Goes, a fascinating exploration of the past, present and future of the river. From its headwaters near the Continental Divide to a delta in Mexico that almost never sees water anymore, Owen travels to understand the competing interests of agriculture, municipal water systems and outdoor enthusiasts as growing populations and climate change continue to put a squeeze on the Colorado's flow. 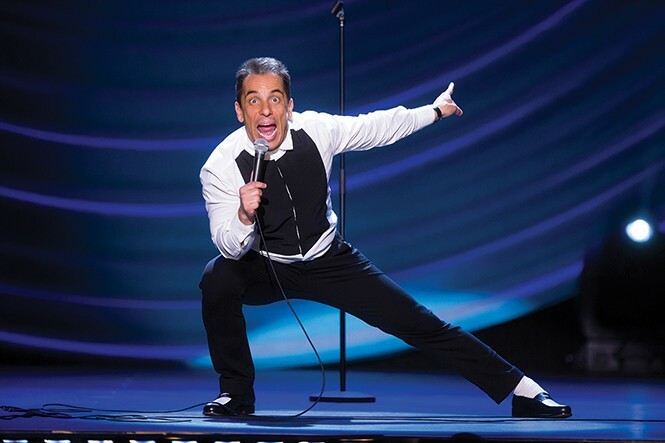 Sebastian Maniscalco is the voice of today's Everyman, a comedian who expresses fury and frustration over the absurdities often found in daily circumstances. With his routines, he creates a common and comedic bond that audiences easily relate to. Maniscalco maintains his stand-up is inspired by things everyone experiences, but he also proves a point. "The things I see when I leave the house constantly shock me," he admits in an email interview with City Weekly. "The way people behave and the lack of etiquette they have are astounding. Is anyone embarrassed anymore?" Gleaning lessons learned from his Italian upbringing, Maniscalco clearly has no qualms about sharing those observations with his audiences. Although his commentary isn't laced with profanity, his conviction is always evident. That's regardless of whether the topic is gift giving at Italian weddings, overbearing TSA agents, using antifreeze on bologna to dispose of wildlife intruders or participating in Passover as an outside observor. Named Just for Laughs' 2016 Stand-Up Comedian of the Year, Maniscalco recently unveiled his third Showtime special, Why Would You Do That? In addition, he boasts several feature-film appearances and a Friday night podcast, all of which provide a platform for the wit, wisdom and skepticism that speaks for so many alienated individuals. UPDATED April 20: This performance has been postponed due to the impending birth of Maniscalo's first child. 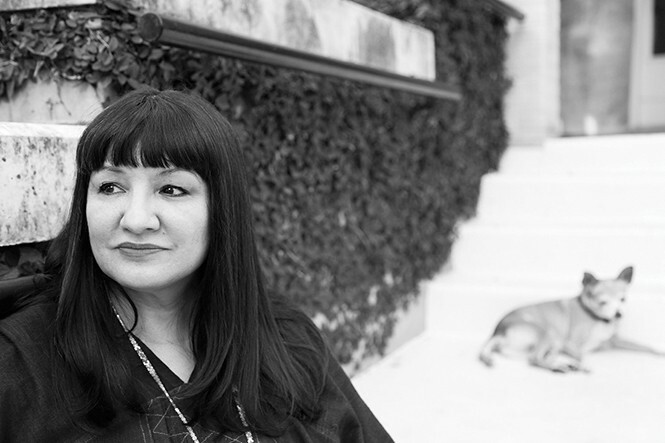 Award-winning author Sandra Cisneros was told throughout her childhood in a predominantly Puerto Rican Chicago neighborhood that there were certain expectations of women in her family—to be like the other women who "lay their necks on the threshold waiting for the ball and chain," as she described through the narrator, Esperanza, in her book The House on Mango Street. Refusing to fit neatly into the stereotypical role her father and brothers had in mind, she attended Loyola University to pursue a degree in English. There, among her mostly white and privileged peers, Cisneros realized her differences were her strengths. Because of her life experiences, she could write for a group of people that no one ever wrote for. She realized that, as a Chicana, she could write for Chicanas, and make others aware of the experience. What makes her work stand out is her easy-to-read bilingual style, simple narratives, and her examination of both Chicana and feminist identities. She shows readers how little they know about her culture, while simultaneously making them feel right at home. "Cisneros writes not simply of the Latino experience," says Bob Goldberg, director of the University of Utah's Tanner Center. "Her words reach to people of all communities and remind us of the human spirit that binds us together."